voltcap® hard eye and face protection has been developed to offer thorough security appropriate to the hazard risk category. It provides linemen and electrical workers with active protection against arc flash to their eyes, in addition to head and face protection. Using optrel's innovative optical lens technology, voltcap® hard's autodarkening lens reacts quicker than a blink of the eye to light flashes, immediately protecting linemen's eyes before any other body part. In contrast to clear visors, voltcap® hard protects the eyes from temporary blindness and permanent eye damage. The Arc Flash Helmet is to be used with MSA Class E V-Gard® hard hats (sold separately). The specially coated lens allows a realistic perception of colors and a clear view of the environment. Colored wires can easily be identified in open/inactive state without lifting the mask. 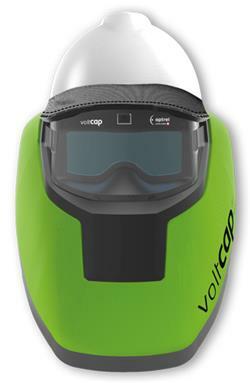 voltcap® hard is one of the lightest eye and face PPE for electrical workers. Its ergonomic design minimizes strain on the head and neck, ensuring comfort throughout the work day. voltcap® hard's LCD autodarkening lens and washable textile (Style FR-Tex CA 350, Arc Rated) are thermally resistive to destruction or ignition when exposed to intense heat and light.